This sparkling wine cocktail was an unexpected treat! A traditional bellini is usually prosecco combined with peach puree or juice. Oftentimes, peach schnapps is added as well, but it’s not required. 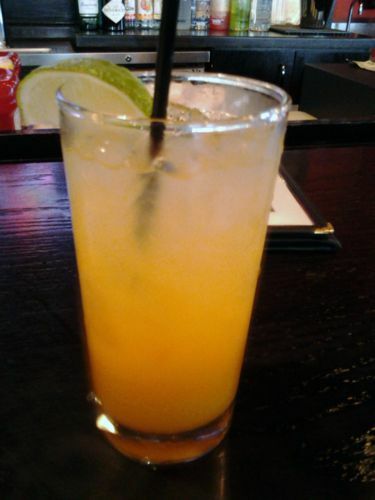 However, whoever comes up with the drinks at the Nantucket Grill in Sutton Station made the brilliant choice to use that peach schnapps and rather than stick with peach puree as well, use mango juice in its place. Peach and mango taste fairly similar, but mango has that extra tropical punch that can be either overwhelming or delicious. Combining it with peach schnapps grounded the mango flavor; it’s definitely there, but it’s more subdued than you expect of mango. This bellini is also made with frizzante sparkling wine rather than prosecco, which means that it’s semi-sparkling and not so overwhelmingly bubbly, allowing the fruit flavors to shine. In other words, the mango bellini is an improvement on your basic bellini, and you ought to be drinking one now. I love mango and find prosecco to be too bubbly so this sounds perfect to me! I’m sure you could approximate at home pretty easily, too!